Bringing CBMDA Networking To You! It’s a local networking, informational, small workshop gathering in regions of California where there are dealers who may find it difficult to travel to a general meeting of CBMDA. We bring low cost events to your area to meet, greet, establish or re-establish business relationships that will help you profit by association. 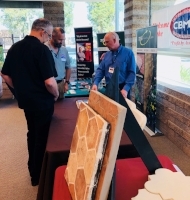 Bringing new innovative products to your area, instructing how and when to use vendor products, socializing with all local members and guests. Displays, sponsorship availability, raffle prizes, games, demos, food, beverages (non-alcoholic), and good conversations, make these events worthwhile for a few hours at a local location that is easy to get to, get home from, low cost, and is sure to be fun. CBMDA Roadshow coordinator may invites a dealer or associate member (or they may, of course, volunteer) to host the local event. By hosting your company provides the venue, the location and area in your facility to have the event. The host helps the main sponsor, usually an associate member, arrange for tables, chairs, table cloths, etc. from a local trusted party rental shop. The main sponsor, with your help, will contact local catering establishments to arrange for refreshments (and pick a menu; suggestions are always welcome). Entertainment is welcome at the event, as well as, short presentations. CBMDA’s office, if required, will finalize details and help coordinate all efforts. Sponsorship levels will be available for a variety of advertising and recognition levels. Donations of raffle prizes are welcome to create a fun atmosphere for everyone. You can even sponsor the entertainment, the presentation, etc. Meeting local dealers in a central location to network, review new products, share ideas and knowledge. All local building material dealers (current members or not), all member vendors are welcome to participate but if the host company asks that no displays of competing products be displayed, we will respect that request. Nonmember associate vendors may participate but we ask that they seriously consider becoming a paid member. CBMDA office may assist the host and main sponsor to create flyers, email, and web announcements for distribution by hand, mail etc. We find personal invitations work best to ensure a great turnout and help build good relationships with your neighboring dealers and vendors. These Roadshows are designed to be FREE to invited dealers, guests, and members. The cost is covered by sponsors. To sign up to be a host location or main sponsor, call or email the office. CBMDA’s goal is to have a Roadshow every couple of months. We need your participation to make this work. The day of the week for hosting a Roadshow is flexible at this time. As we get established, we will create a schedule and post information on the web and emails. Please sign up for MailChimp for an efficient way of keeping our interested folks updated. Click this link to join now! Since our Board is from Southern California, we have started here. Our first Roadshow was held at ORCO Block’s facility in Stanton CA. We are planning to have the next one at E Z Mix’s facility in Rialto on November 2, 2018, then hopefully moving east, then west and north up the coast to Ventura/Oxnard area, and last, but certainly not least, beyond to Central and Northern California!